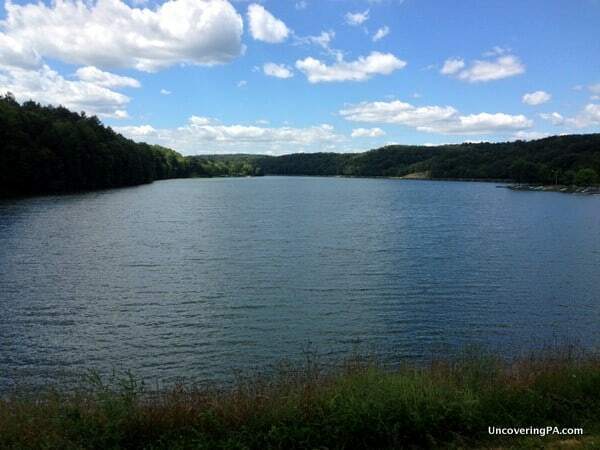 Of all the state parks in Pennsylvania, Little Buffalo State Park stands out as having one of the most odd names. I mean, when was the last time you saw a herd of buffalo roaming around Pennsylvania? 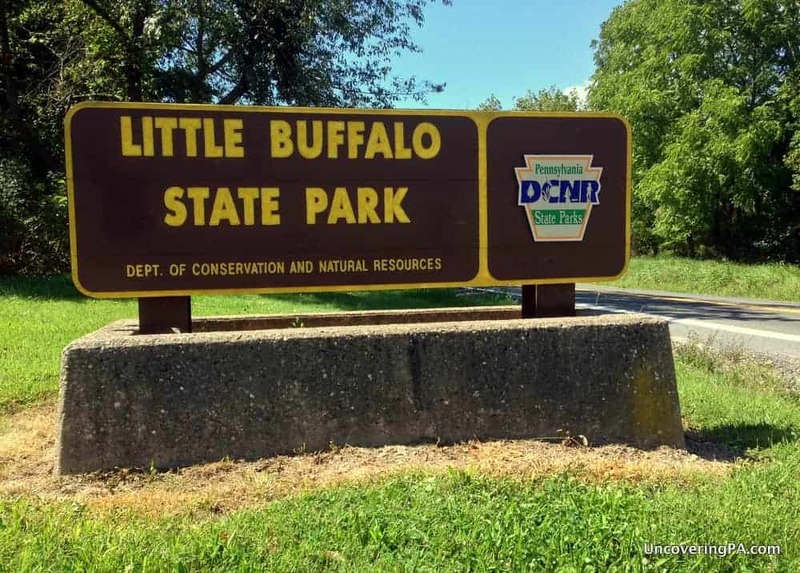 However, it is believed that at some point in the distant past, American bison once roamed the valleys of Pennsylvania, and thus, Little Buffalo Creek and Little Buffalo State Park received their odd names. If a herd of bison visited the park today, though, they would struggle to find land to graze on. The land of the park is dominated by the 88-acre Holman Lake. Created by the damming of Little Buffalo Creek, the lake is popular with fisherman. 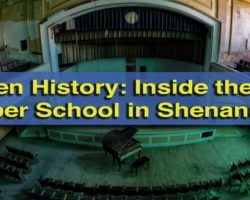 Surrounding the lake are the rolling hills of Perry County and several historical buildings; leaving little room for a herd of bison to graze. In order to see as much of the park’s nature and history as I could, I opted to hike a combination of trails in a 5.5-mile long circuit of Holman Lake. 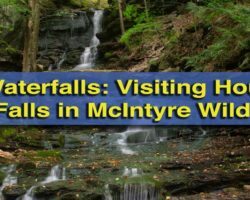 The hike was fairly similar to what I found in the excellent 60 Hikes Within 60 Miles of Harrisburg by Matt Willen, though I did modify it a bit. My hike started at the ranger’s station near the park’s entrance. This area is a great place to pick up a park map and offers your only stop of restrooms outside of the summer months. 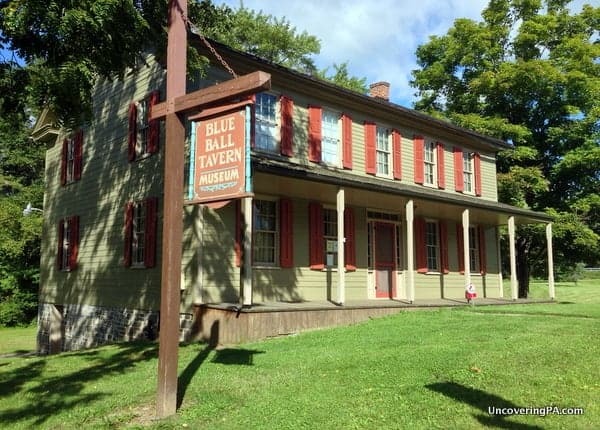 Blue Ball Tavern serves as the Perry County Historical Society Museum and the starting point for your hike. Across the street from the ranger’s station is the historic Blue Ball Tavern. The tavern is the current home of the Perry County Historical Society Museum. 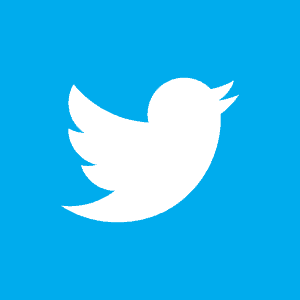 Unfortunately, however, the museum is only open on Sundays from 1:30-4:30pm, which makes visits a bit inconvenient. Nevertheless, the building is quite interesting to look at and makes a great point of reference for starting and ending your hike. With your back facing the back of the tavern, head to your right along the Exercise Trail. This easy trail is a great way to warm up before starting on the more difficult parts of the hike. 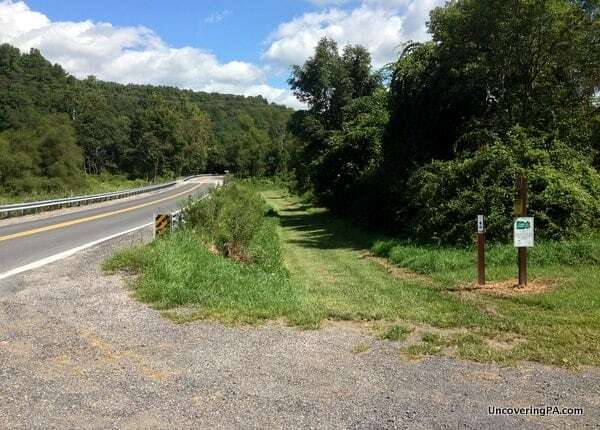 Follow the trail for roughly half a mile, until you come to a split in the trail near Little Buffalo Road. When you get to this t-intersection, turn right and head towards the road. Turn right at the split and carefully cross the road. Just a few feet away, you’ll see the start of Middle Ridge Trail. This 2.5-mile-long trail is listed as “most difficult,” but even being fairly out of shape, I didn’t find this trail to be too taxing. The starting point for the Middle Ridge Trail in Little Buffalo State Park. The Middle Ridge Trail follows along the ridge line of the hills on the lake’s northern side. There are several areas where the trail rises steeply, but only for short periods of time. For those that need a rest, there are several well-placed benches along the trail. A little over half-way along the Middle Ridge Trail, you’ll cross over Black Hill Rd, picking up the trailhead a little uphill on the far side of the road. From there, continue along the trail before it finally ends back on Little Buffalo Road. Hiking along the Middle Ridge Trail. Facing the road, continue your hike by heading across the road and to your right. 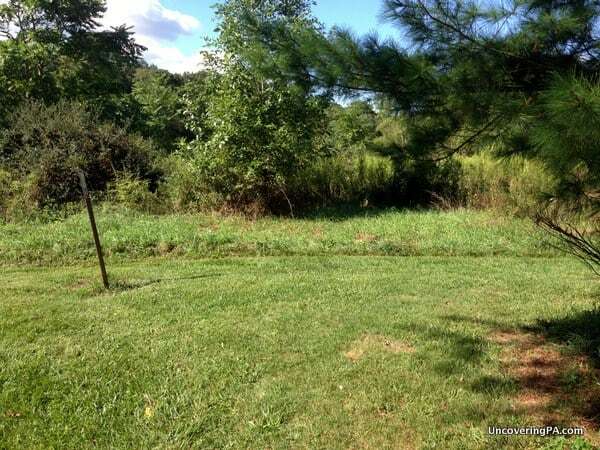 You’ll cross over a small stream and a sign welcoming you to Centre Township. Near the park entrance sign, you’ll see the Little Buffalo Creek Trail. Follow the creek downstream. This is a nice, level hike along the Little Buffalo Creek that gives the park its name and creates Holman Lake. The starting point for the Little Buffalo Trail towards Holman Lake. Eventually, the trail comes to the access road to the main picnic and pool area. Follow the road for a few hundred yards, until the trail once again disappears into the woods. Shortly thereafter, the trail will dead end into a narrow rail trail. 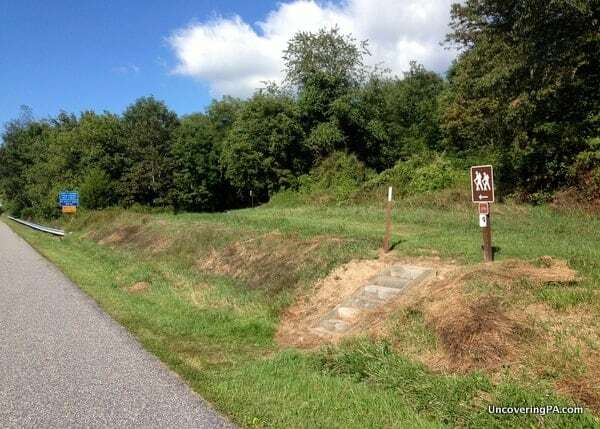 Follow the trail to the left for a few minutes, and you’ll end up at Little Buffalo State Park’s main recreation area. In this area, you’ll find many picnic tables, a playground, and a very nice looking swimming pool. Little Buffalo State Park swimming hours are 11am – 7pm, but be sure to check out the Little Buffalo swimming pool rates on the PA DNCR website. However, as inviting as all that may seem, your hike isn’t yet finished. At this point, you have a choice. 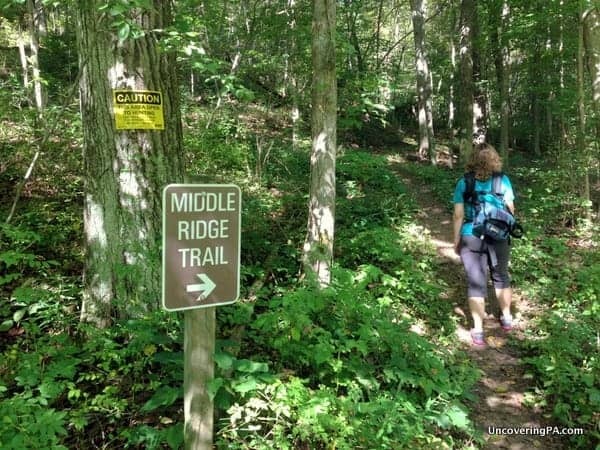 If you are looking for a slightly longer and more challenging trail, take the Buffalo Ridge Trail from close to where you entered the parking area. If you’re like me, however, you might want a little easier and more scenic route back. If so, head out across the parking lot to the mile-long Fisherman’s Trail. 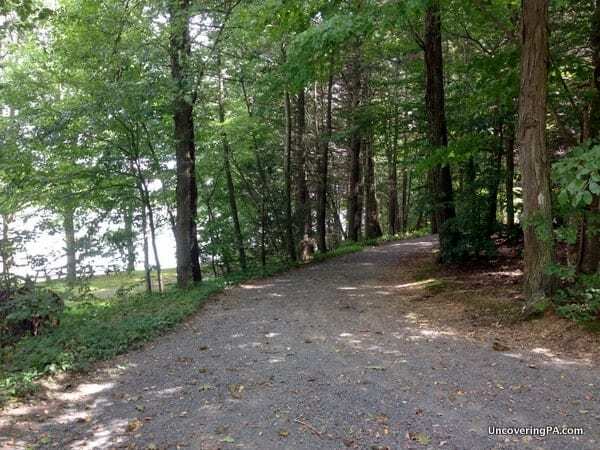 This trail follows along the lake and through a beautiful canopy of trees. The Fisherman’s Trail along Holman Lake. After walking this trail for about 10 minutes, you’ll see a short trail that veers off to your right. This trail is a bit more challenging, but isn’t very difficult and takes you to an overlook above the dam breast. From the overlook, walk down the stairs here for a great look over the entire lake from the top of the dam. The view of Holman Lake from the top of the dam in Little Buffalo State Park. After you get your fill at the top of the dam, head down the stairs. From here, you can take a quick diversion to check out an old railway car to the right that used to run along tracks through the park, but once you’re ready, follow the signs to Shoaff’s Mill. 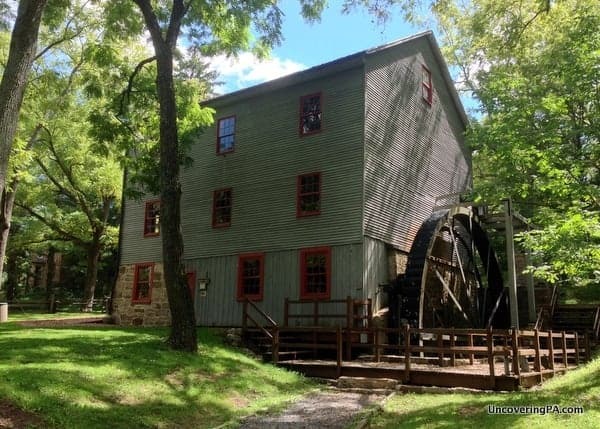 Shoaff’s Mill is an old grist mill that was used to grind local farm products until the 1940s. Open on weekend afternoons from May to October, the mill offers tours that include the chance to see it in action grinding up corn and apples. The historic Shoaff’s Mill in Little Buffalo State Park. 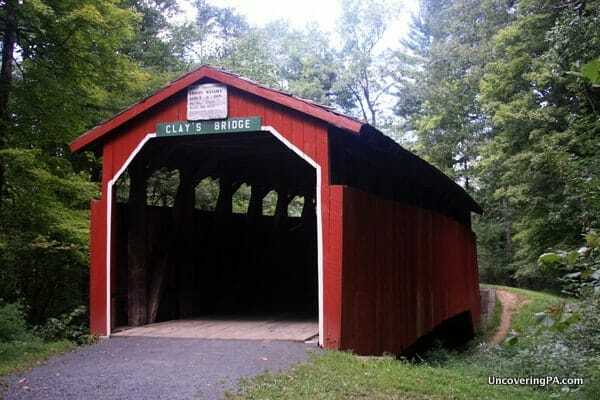 Just down the hill from the mill is Clay’s Covered Bridge. This 82-foot long covered bridge was built in 1890 and used to cross over Little Buffalo Creek before the lake was made. Today, it’s more of a show piece, but is still worth checking out as crossing over it is right along the path to get back to the park office. 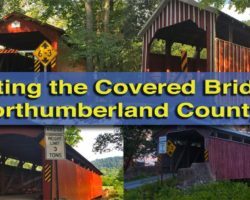 From the covered bridge, follow the Blue Ball Trail for about 5 minutes until you are back to where you parked your car. Overall, a hike through Little Buffalo State Park is a great way to spend a few hours of your day. 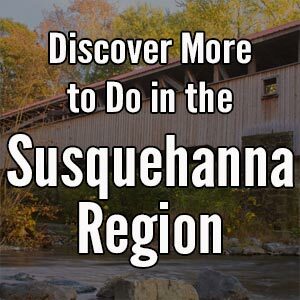 While it might not be the most beautiful or the most historic state park in Pennsylvania, the combination of the two, combined with the park’s proximity to Harrisburg make it a great outing for anyone in the region. I’ve included a very basic map below that outlines the hike that I took. If you want more information on the park, including a complete map, check out the park’s website. 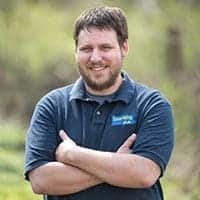 And, if you want a great resource for hiking in the Harrisburg area, definitely check out 60 Hikes Within 60 Miles of Harrisburg by Matt Willen. A very basic map showing you the starting point, route, and direction of the hike of LIttle Buffalo State Park described above (Only a reference. Please use a real park map when hiking). how long is your proposed hike you planned out?